May 1, 2010 — With a bike for The Mrs sorted, now it was time to find something for me. I really liked that we’d found her a Honda, and so I wanted one too. I have a fondness for Honda because I’ve owned a couple of their cars and driven them beyond 200,000 miles. It also made sense to have two bikes from the same make just so that any special tools would apply to both bikes and to maximize the possibilities of shared accessories. Three Honda models really peaked my interest: the CB750, the CB650 and the CX500. My first preference was actually for the CX500. I love the Moto Guzzi style transverse twin and shaft drive. I’d even scheduled a meeting with a Craigslist seller, but there was a problem. 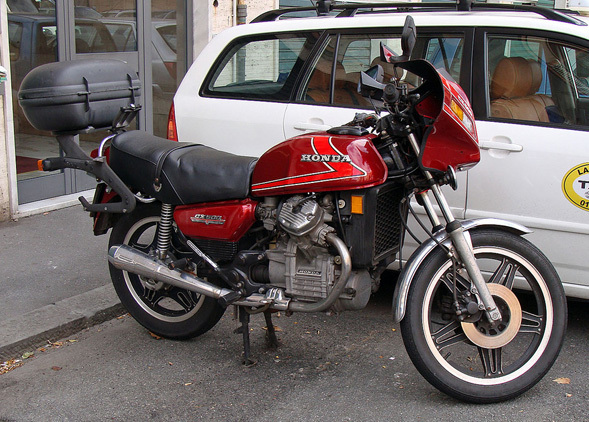 I learned from my father-in-law (a man who’s owned an astounding variety of motorcycles over the years) that these bikes were notoriously underpowered. “It’s a pig.” he told me in an email. That’s no good. I wanted to be able to keep up with The Mrs on her CM400. After looking up the specs, it became clear that the CX500 was not going to allow me to do that. This left the CB650 and the CB750. The CB750 is an icon in classic japanese motorbikes. It’s the platform of choice for modern Cafe Racer conversions. Its inline 4-cylinder engine is basically bulletproof and even sounds like an old Ferrari when you romp on it. The CB650 is a nearly identical bike, but in a slightly lighter package. On paper, it’s actually the faster bike, helped no doubt by its 85 lb weight advantage. The CB650 is also a tad more rare. 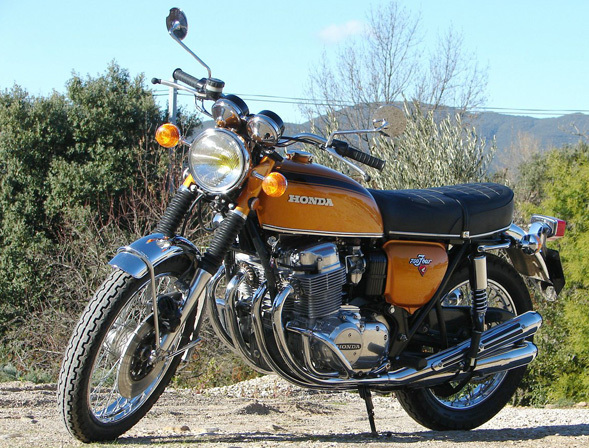 They’re hardly collector’s items, but Honda simply didn’t sell quite so many as they did of the ubiquitous CB750. Saturday came and their closing time went. Not a peep. 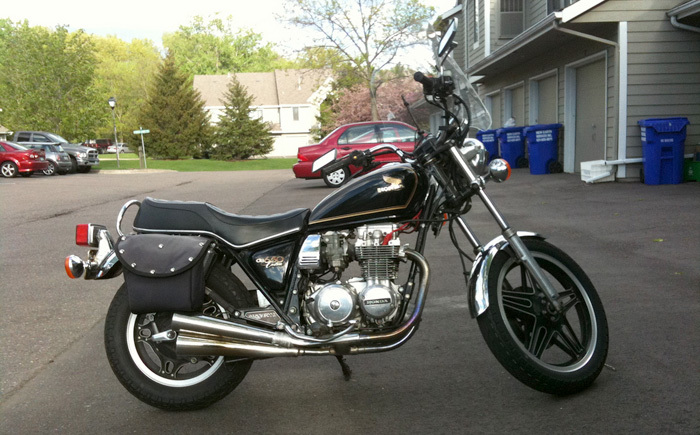 Frustrated, and admittedly impatient, I did one last search on Craigslist for “Honda CB650.” I found an older listing that looked like it might be just the ticket. I called the guy, asked him my now well rehearsed list of questions and everything sounded good. 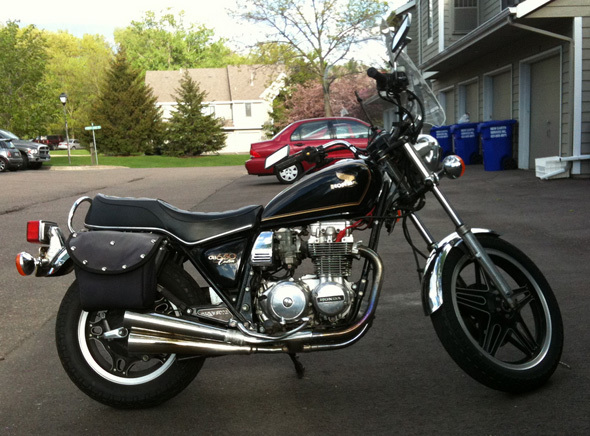 The Mrs and I drove over, and there it was: a pristine-looking 1980 Honda CB650 Custom. It was black and gold just like my old Honda Prelude — my very first car. It was an omen! It was also, at least as far as I could tell, a sound motorcycle. It took me quite a while to get used to using the clutch on that 4-cylinder, but I finally did make my way down the driveway. My test ride was a pretty surreal experience. This thing was a lot more bike than what we’d bought for The Mrs. I have to admit, I was questioning myself. Can I handle this? Am I ready for this much machine? My test ride wasn’t so much an evaluation of the motorcycle as it was an indictment of my own poor clutch skills. What I could tell, though, was that the CB650 is a hell of a machine. It’s quick. It’s nimble. It felt much more composed and responsive than I’d ever expect a motorcycle to be. The price was right too, at a little more than half what I would have paid for the same bike from Sport Wheels (who didn’t actually call me back until the following Wednesday, but whatever). I filled out the title, The Mrs paid the man and I was soon away on a new iron horse. What have I gotten myself into?! The ride home was partly exhilarating, partly terrifying, but mostly fun. This bike came with a big windshield installed on the front of it. Normally I like windshields, but this thing thundered in the wind so badly I thought I would surely be deaf by the time I we got home. I made my way through St. Paul on 35E from Stillwater where we’d picked up the bike. It was a lot to take in. The bike was so solid, very comfortable in the suspension, and much more responsive than I’d ever expected a big bike to be. On the downside, the handlebar position was terrible. My throttle hand was cramping something awful from the combination of the goofy angle and my hanging on for dear life. That ride home was a blur of adrenaline and horsepower. It was a little stressful if I’m honest. The gravity of the whole arrangement seemed so massive. There was the small, but not insignificant amount of money we’d spent on it. There was the power, the weight, the sheer unfamiliarity of the whole thing. I wasn’t regretting it, I was simply having trouble taking it all in — especially now faced with the reality of just what a terrible motorcycle rider I was. It didn’t feel fatalistic. It just wasn’t the euphoric “bonding with the machine” I’d expected and hoped it’d be. Slightly overwhelmed, I finally arrived home. I parked the bike in front of our garage and its name flashed into my mind as I dismounted. I’d thought of Sonny Chiba in Quentin Tarantino’s Kill Bill Vol. 1 — this older, distinguished japanese man who was master of his craft. I remembered the black and gold of the sword he presents to The Bride. Hanzo. The bike’s name is Hanzo.